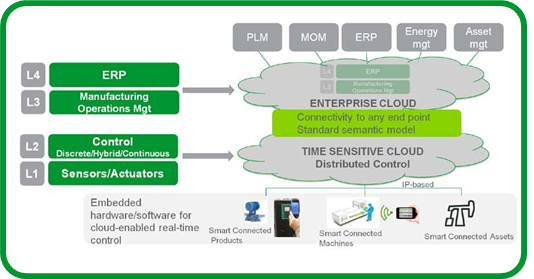 Wonderware: At what levels of automation should the IIoT be implemented? At what levels of automation should the IIoT be implemented? This blog post focuses on the IIoT impact on automation architectures. 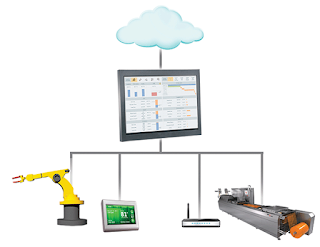 As smart manufacturing enterprises start implementing smart enterprise control and asset performance systems managed by augmented operators, automation vendors will respond by implementing IIoT at all levels of the automation hierarchy. This will allow easy integration with next generation IIoT systems. In addition, with the increasing power of embedded electronics, connected intelligence will migrate down to the lower levels of the automation hierarchy – to the control level and to the sensors and actuators. As a result, operations technology (OT) systems will merge with information technology (IT) systems and the automation hierarchy will evolve to be a much flatter and more information-driven architecture. Since the future implications of this are still unclear, the technologies and architectures employed must be flexible, adaptable to change and capable of integrating with legacy systems. The monolithic, single-source, hierarchical approaches and architectures of the past will not work in the future. The information-driven topology is shown below. A time-sensitive layer for real-time deterministic control. This layer is often referred to as “fog” or “edge”. However using the term “time-sensitive IP-based” for this layer underlines the fact that the technologies included in this layer are fundamentally the same IIoT technologies used in the enterprise cloud layer, but are optimised for real- time deterministic communications. The OT devices that comprise this time sensitive layer (sensors, actuators and controllers) will be cloud-ready and capable of interfacing transparently with the IT business systems of the second layer. Those same devices will also have a high degree of intelligence. Consider the example of control valves with embedded temperature, pressure and acoustic sensors. They are able to operate autonomously using set points from the enterprise, determining their own needs for preventive maintenance, and informing the maintenance department of their condition in a timely manner. A cloud enterprise layer where enterprise systems (ERP, MOM, PLM, SCM, CRM, etc) and next-generation functions including asset management and energy management interoperate with each other and with the time-sensitive cloud-ready systems. The use of the term cloud above refers to the technologies used, rather than the physical location of the infrastructure. There are many reasons to believe that, in the industry automation business, “on-premise” clouds (commonly referred to as “edge”), will be the most widely used architecture. The arguments for highly centralized redundant control systems versus highly distributed control systems have gone on for many years. Proponents of each architecture fiercely defend their position with valid arguments. The advent of IIoT does not resolve this long-standing debate. On the one hand, the use of cost-effective embedded electronics in field devices argues for more distribution of intelligence and control. On the other hand, the high speed IP-connectivity of field devices enables a more centralised architecture where all the sensors and actuators are connected to a highly redundant and powerful multi-core processor located in a secure on premise data center. Today an application is programmed with a particular hardware target in mind, for example a PLC. Tomorrow, an application will be programmed independently of the underlying automation hardware, and the system will distribute the application transparently to the hardware, configuring all communication mechanisms automatically. This approach will allow users to choose either a highly centralized or distributed architecture, or a hybrid approach based on their specific requirements and concerns. A Distributed Control Standard (IEC 61499) exists that will facilitate this work and which can be used as the basis for an IIoT distributed control standard. The distribution of intelligence into the field will allow smart connected products and smart connected machines to publish important information in a standardized format. Intelligent brokers will make this information available in a transparent manner to the systems and applications that require it. This approach will overcome one of today’s current challenges: the location of information is unknown and therefore cannot be discovered or exploited without custom programming. Implementing large networked systems with today’s classical automation techniques is complex. Tomorrow’s IIoT-based automation systems will require a new approach to simplify the design, the management, and the maintenance of networked automation architectures. The next blog posts offer expert perspectives on subjects such as Technological elements leading the IIoT evolution, SMART Machines and how they contribute to the future of the industry.